➢ “The series is a wild ride, an old-fashioned Western with a contemporary edge … The entire series – which plays like a seven-hour movie – was directed by Scott Frank from his screenplay. He keeps the tension throughout without over-hyping scenes. Death is bad enough. Using natural light, the cinematography from Steven Meizler, who has filmed for Steven Spielberg and Steven Soderbergh, infuses the scenes with the unease of vulnerability. Godless is the Western you’ve been waiting for.” — Los Angeles Daily News. ➢ “Godless embraces every facet of its ilk, from a core conflict between white and black hats to the illicit romances built by lengthy glances and implicit understandings. There are posses of gunfighters roaming through small towns, tense shootouts in dirty saloons, and sweeping vistas of such a scale you’ll wish you could see it in a cinema. It’s a western, and a damn fine one at that.” — IndieWire. ➢ “Anyone pining for an honest-to-God Western with vividly mythic characters, soaring vistas and thrilling showdowns will find the seven episodes of Godless a heaven-sent, rip-roaring Thanksgiving-week feast.” — TV Guide. 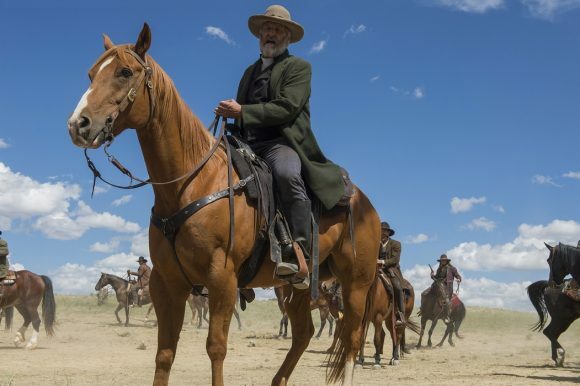 ➢ “Godless is a dreamlike western. It has familiar elements. Gunfights in saloons and desperadoes robbing trains. But it evolves slowly into a questioning look at the western myth – the role of hard-rock Christianity in excusing terrible violence is touched upon. Also, it ensures that women are not forgotten in this West. They are its soul. Gorgeously made to offer stunning vistas of beauty and defilement, it is brooding, inventive and laconic. Remember ‘laconic’ because it isn’t made for the fast-paced pleasure of frantic binge-watching.” — The Globe and Mail. ➢ “As in many of the best Westerns, one of the principal characters is the landscape itself. This is one lavishly and beautifully shot vision of 1880s Santa Fe. I mean gorgeous. I mean like Howard Hawks would watch it and go ‘Yup.’ If you love Westerns, this is definitely one to try. If you don’t, check it out anyway; it’s very likely to seduce you.” — Paste.